Ariel & Faith Mahilum graduated from International Grace Bible Institute in the Philippines. Among other responsibilities, they have planted two Grace churches in the city of Cebu in the Philippines. 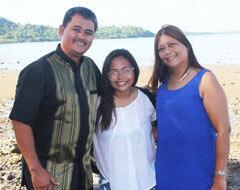 While working with Vernon & Darlene Anderson in Cebu, the Mahilums felt the call of God to missionary work. They entered a missionary training course while Ariel was still working as a pastor. That course took them to Palawan in the Philippines and now to Cambodia. Greetings in the wonderful grace of our Lord Jesus Christ. Happy New Year 2019. Maybe this will be the year He comes for us! 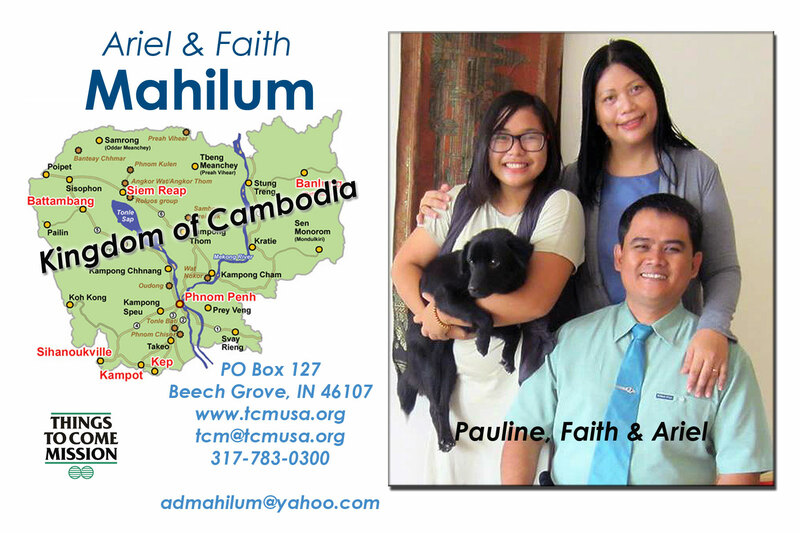 I am writing to inform you that Ariel & Faith Mahilum have resigned as TCM missionaries effective January 7. Last year they had mentioned a long-term plan to leave Cambodia, but for their own personal reasons they decided this was the proper time. They left Cambodia on January 8 and are starting a new life in the Philippines. They asked that we convey to you their gratitude for your support over the years. The Mahilums continue to be members of TCM-Philippines and we pray they will find ministry there. Below is a paragraph from my letter to them in accepting their resignation. TCM will continue to send financial support to the Mahilums through the end of February. This will help them to get established in the Philippines. Thereafter, any gifts for Mahilums will go to the Cambodia Team account. The Mahilums were “Team support missionaries.” One of the principles of Team support is that the Team is supported as a whole. If a missionary leaves, the funds will remain with the Team to ensure that the gospel outreach continues in that country. If you want to continue supporting TCM’s work in Cambodia, please designate your gifts Cambodia Team for missionaries’ living/personal expenses or Cambodia Field for ministry expenses. The other missionaries in Cambodia who are continuing the ministry are James & Agape Bermejo, Myra Omictin and Julia Liles. Julia is an individual support missionary and the others are Team support. Please continue to pray for and support Team Cambodia so that the people of this country can hear the good news of Jesus Christ. Thank you for supporting the Mahilums these years. Through your support for them, the Grace gospel was established in Cambodia. Now TCM will keep building on that foundation. Read the latest newsletter from the Cambodia Team (Mahilums, Bermejos, Myra and Julia) by clicking Newsletter in the right side bar. The Mahilums first arrived in Phnom Phenn on June 13, 2006. This was the last stage of their missionary training course in the Philippines. They went to gain experience and work with missionaries who were already in Cambodia. The Mahilums moved to Phnom Phenn in 2007. Thirteen university students share their home and all are now becoming leaders for outreach into Buddhist villages. Grace International School attracts Cambodians with English, Computer, and Music subjects, and a Grace Church has begun in the house. Pastor Ariel and Faith work to disciple these students. The Mahilums started the Phnom Penh Grace Church fellowship with a small group of college students more than 3 years ago. Today there are newcomers, both Filipinos and Khmer, who join regularly in the Sunday and Monday services. Now the Cambodian college students lead singing, play the keyboard and guitar, teach and even preach the word. The apartment TCM rents has three stories. The 2nd and 3rd floors serve as a dormitory. It is a training ground for the college students as they learn the Bible and serve in different ministries as volunteers. The college students in the dormitory are required to take up Bible lessons or theology classes, Pastor Ariel offers courses in Bibliology, Theology, Homiletics, etc. He also teaches the Highway of Life to the core group. It is inspiring that the older students (the first batch) now teach the newcomers The Highway of Life series.